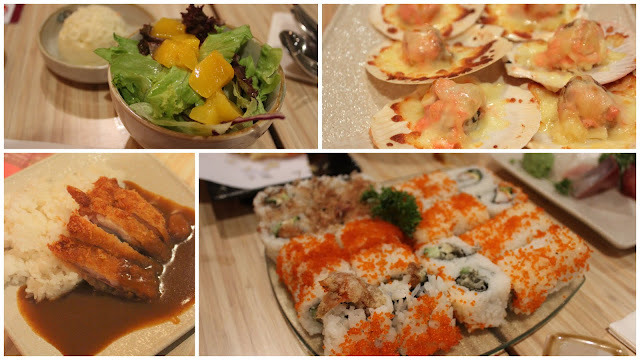 Located in Valley Point, Kuru Kuru is a small casual japanese restaurant. The food is not all authentic jap. There are subtle additions of our favourite western ingredients like cheese and mayonnaise. I won’t say the food is super fantastic but given the price I think it’s an awesome place to pig out with the family and friends. The buffet for adults goes for $30++ and $26++ for dinner and lunch respectively. For children it’s $18++ and $15++ for dinner and lunch respectively. If your child’s height is below 1.1m, he gets to dine for free (1 non-paying child for every adult). There is a grand total of 137 choices on the menu. 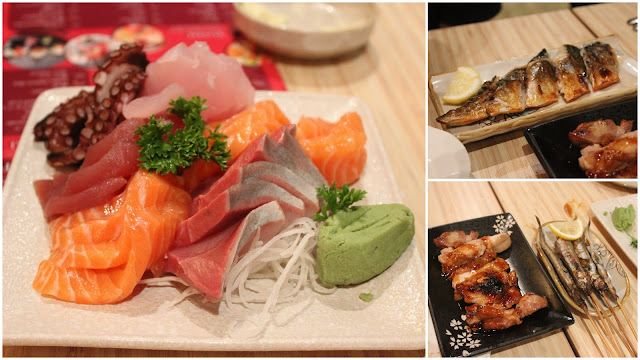 Get the mixed platter sashimi, one for each person if you wish! The fatty slabs of salmon were joy. Didn’t like the tuna or the swordfish but I think that’s a personal preference. The grilled items are a must-try. Everything was nailed down to the T. Crispy with minimally charred outsides and moist juicy flesh for everything we ate, including the mackerel (which is in my humble opinion, the best grilled mackerel I ever had and it being deboned was a major plus). It’s a pity we only discovered this towards the end of our meal. Otherwise I would have indulged in more variety! Didn’t try the prawn tempura because I’m allergic to them but the vegetable tempura were done so well. 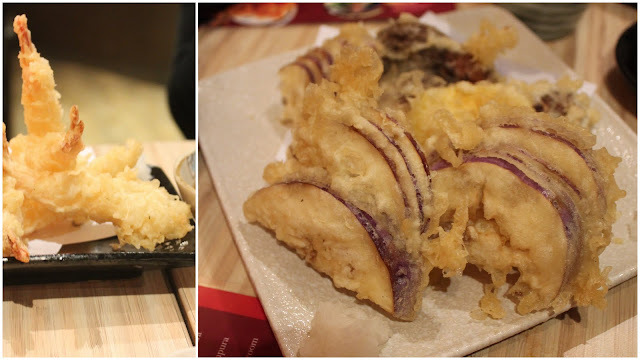 Go for the egg plant and mushroom tempura. Now for the less impressive. Didn’t like the salads (potato salad, and peach salad)- never liked them anyway. Scallops with cheese and mentaiko sauce didn’t taste good mainly because of the scallops which were too tiny and bouncy. The sushi fillings were good (deep-fried softshell crab, fried salmon skin and cream cheese, california roll) but the sushi rice was far too clumpy and soggy. The katsu failed for me more because the batter kind of separated from the chicken inside. And for dessert, I went with a safe choice of green tea ice cream and red bean. I came here with the friends before and ordered ala carte but seriously, the buffet dinner price is so much worth it!